IRVINE, Calif. – No. 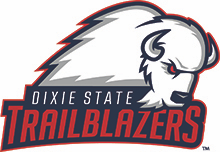 18 Dixie State softball edged No. 12 Concordia-Irvine on Friday for a thrilling 3-2 victory at the NCAA Division II West Regionals in Irvine, California. The Trailblazers (40-8) found themselves in an early 1-0 hole, but scored one run in the fourth, fifth, and sixth innings to claim the comeback victory. The win marks the fifth time in the last six seasons Dixie State has won 40 or more games in a single season. After a scoreless first inning, Concordia-Irvine opened the scoring in the bottom of the second. The Eagles opened the inning with two singles, then loaded the bases with a one-out walk. Cambrie Hazel struck out the next CUI batter on five pitches, but the 1-2 pitch during the next at-bat sailed to the backstop, allowing a CUI runner to score from third to build a 1-0 lead. Hazel forced a groundout back to the circle on the next pitch to escape any further damage. Kaitlyn Delange singled in the top of the third, diving head first into first base to complete the play, but back-to-back groundouts ended the threat. The Trailblazers broke through in the top of the fourth when Kenzie Sawyer belted her sixth home run of the season over the fence in right center field to even the score at 1-1. Dixie State took the lead in the top of the fifth. Dani Bartholf opened the frame with a single to left, then moved to second on a Delange sacrifice bunt. Bartholf then scored on back-to-back CUI wild pitches to push the lead to 2-1. The Trailblazers scored a crucial insurance run in the top of the sixth. Sawyer drew a leadoff walk, then moved to second on a botched pickoff attempt. Sawyer advanced to third on a Jessica Gonzalez sacrifice bunt, then scored when Kori Gahn drove the first pitch she saw to the right-center gap for a sacrifice fly to extend the lead to 3-1. The Eagles pulled a run back in the bottom of the sixth with a solo home run to center field to cut the lead to 3-2, but the home team couldn’t score again. After DSU went down in order in the top of the seventh, Hazel and the Trailblazer defense duplicated the feat, retiring the Eagles in order in the bottom of the seventh to clinch the win. Sawyer led the charge at the plate with the home run and a walk drawn with two runs scored. Hazel (18-3) tossed a complete-game gem, allowing two runs on five hits with seven strikeouts. Dixie State now advances to Championship Saturday and will battle the winner of Concordia-Irvine and Academy of Art at 11 a.m. Pacific Time (Noon MT).